I have asked this question before through Facebook and seem to get the same answers from a high number of people. They say that their children inspire them. A friend of mine posed the same question to her friends and received a slightly different set of comments but it brought me back to the answer I received on mine. I think it’s fantastic that your children inspire you. Our children keep us young at heart and motivated to stay good people, amongst other things. 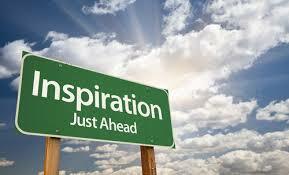 But it is important to think about what else inspires you. What happens when your children are grown and have lives of their own? You will need to be sure that you have many sources of inspiration to keep you going. You should be sure that you are close to the top of that list. When you draw from several sources, your options are wide open. After giving it thought I came up with my own short list. It is incomplete at the moment because I know I need to give it further thought. I am inspired by challenges in my life that force me to look inside for strength. I seem to thrive on the personal challenges that I take on, the challenges where I force myself to step outside the box and say, “I’m not really sure that I can do this,” then I do it. I’ve learned to stop looking for outside motivation as often, I turn within. I find ways to pull my own energy into higher thought and search my spirituality for inspiration and encouragement. When I need it externally, I read different authors such as, Napoleon Hill, Bob Proctor, Don Miguel Ruiz, Anthony, etc. I talk with my family, they know me well enough to give me strength in just the right areas when I need it. I am inspired by dreams of my future, friends, reminding myself of what I’m grateful for, other people’s accomplishments, music, love, hope and happiness. I can’t stress enough how important it is to have more than one source of inspiration and to know what know what they are. It will help you get out of situations when you find you’re having a bad day. Make your list, include as much as possible. You can write it or create a collage. Keep your list with you. Draw from it on your down days or when you need a pick-me up. Reading or looking at it will trigger happier thoughts to help you move forward. If you can create your own inspiration, you have truly won. Be sure to find ways to be your own hero and inspiration. There is nothing truly like it. Thank you for stopping by. Please check out the list of other inspirational posts in the side bar. What are you telling yourself that is stopping you from success? What are those internally spoken words that you have faith in, that are stopping you from getting through a tough situation? What if you could change your belief, have faith in yourself; what would you accomplish? Have you ever stopped to think about this? It was in that moment I had to flip the switch in my head and change my disbelief to faith, faith in myself, in my body and in my mind. As I ascended the steep rocky climb to the top, I would tell myself, just take 20 steps then you can rest. I took 20 and added 10 or more. My heart was beating through my chest, my body covered in dirt, sweat pouring down my face and my legs were ready to give out from under me. I was more than twice the weight of 95% of the participants. I would take a break for a few minutes, listening to the encouragement of people as they passed me by. I knew they could cheer me on all day, that’s not what was going to get me to the top and back to the bottom, it was my own thoughts. If I didn’t believe I could, I knew I would fail. The recurring exclamation that I heard was an, “I PAID FOR THIS?” It wasn’t just me. Even the athletes were struggling. It’s time to start planning your vacation for next year. May I suggest one with amazing beauty, history and adventure? I lived in Albuquerque, NM for 3 1/2 years when my husband was in the military and had the opportunity to even work this festival which gave me the chance to see the beauty up close and personal. I wanted to share with you a bit of the joy it brought us by informing you of what the event is about and some of the photos I gathered on the net. Mine are all put away in photo albums from 19 years ago so they are a bit outdated. I would love to go back. This year’s event just ended last week. I should have put this post together much sooner. The picture to the left looks very similar to the tent I worked when I was there back in 1994. I sold these beautifully handcrafted balloons. The Albuquerque International Balloon Fiesta – The World’s Premier Balloon Event has much to choose from over the 8 days it’s in town. Starting at 5:45 daily the hot air balloons are laid out and lit up while they remain on the ground. It is quite a wonder to behold in the dark of the early morning hours. Opening ceremonies start at 6:45 followed by The Mass ascension at 7am. The balloons take off in 2 seprate waves starting from one end of the field to the other. Albuquerque Chainsaw Carving International, a side show to the balloons, brings artists from around the world. It is a fairly new art form but the sculptures are incredible. The carving show started at 8am this year and after they are done the show, the pieces are auctioned off. Early in the week there are not as many attractions and they do vary so be sure to check the schedule before planning your travel. A few of the shows that are mixed in are, The Fiesta of Wheels Car Show, Flying Competition, Concerts (The 2013 event hosted Darius Rucker), Balloon Fiesta Pin Trading, and more. The vendor booths showcase amazing art talent, specialty foods and activities. You may even get to have your picture taken in a gondola. The Night MagicTM Glow and the AfterGlowTM Fireworks Show, presented by Albuquerque Journal, are as equally amazing as watching them light up in the early morning hours but I believe they remain on the ground. A fireworks show is included. In addition to the events listed, there is a great deal to see and do. If you are there for the week,be sure to check out other attractions to visit in the area such as the Pertroglyph National Monument, Old Town, the town of Taos, Carlsbad Caverns or even take a drive around the back side and to the top of Sandia Mountain Crest. Albuquerque has some beautiful attractions. The Albuquerque Convention & Visitor’s Center lists the dates for 2014 to be October 4 – 12. If you are interested, it is best to book as far in advance as possible. Hotels and flights for this week fill quickly. You can find great information on the Balloon Fiesta Website in the Sources section below that lists hotel, fights and accommodation information. Feel free to share with the links below. If you enjoy this blog, follow my on Facebook at Words That Touch Your Heart ~ Missy Bell. I have always believed in the power of affirmations to change ones life. They can be that powerful. I remember learning this several years ago at a seminar created by Bob Proctor. We were told to state what we want in the positive as if we already own it or it is already part of who we are. Do not see a negative, turn it into a positive and write it out. Place it as a hard copy in the form of a sticky note or on a white board, wherever. We were told to make sure to read it aloud, three times a day and state it like we mean it. Have no doubts. The power of the Law of Attraction will manifest it. I’ve tried this many times and have been successful with it. There are so many ways to use the Power of Attraction to get what you want from life but you can also use it to become who you want, to forgive yourself, to push yourself to work harder, think smarter, forgive yourself, etc. The possibilities are endless with this technique. If you haven’t tried it already, give it a shot. You have nothing to lose. Bookmark this page. Come back in a week and let me know how you feel, what you used and how it has helped you. Some things will take longer to manifest. Believing is a very powerful component. If you do not believe, you will not achieve. It takes several weeks to develop a habit. What affirmations have you used lately that you would like to share? Thank you for stopping by. I hope you will check out more posts by looking into the categories section to the right of this post for more inspirations and fear reducing tips. 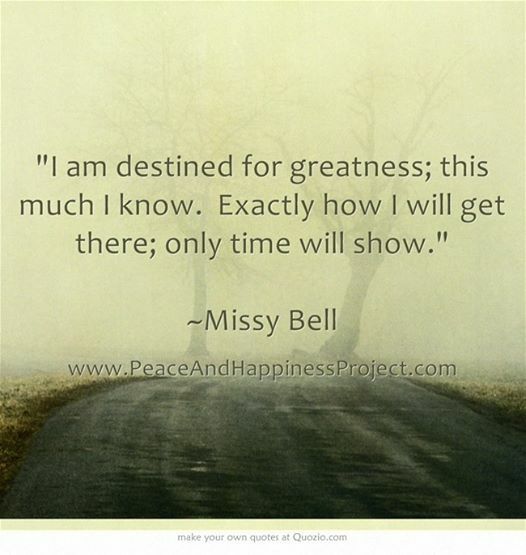 Feel free to stop by my other blog, Where the Ghosts Live ~ Missy Bell.